This week’s challenge was interesting since I am not much of a candy person. I am, however, a sweets person! I am especially partial to chocolate! The dark, rich, cocoa flavor calls my name almost daily! So I guess I will call this my attempt to make a “healthier” chocolate treat. If you are like me, most of the time I just want a little nibble of chocolate to keep my sweet tooth happy. I just need a couple squares of a bar, or a baby handful of chocolate chips, and I feel satisfied. That probably doesn’t qualify me in most people's books as a chocoholic, or serious sweet tooth, but I am pretty sure that being a baker, sometimes I consume more than my share of chocolate through osmosis (lol)! Therefore, I only need a little bite here and there. I am a person who is picky about her trail mix. I do not like peanuts, M + Ms, or super salty pieces in it. However, I do like the subtle mix of sweet and salty. I like chocolate chips, almonds, pecans, pretzels, dried cranberry, or ginger. That means I usually have to create my own mixes from the bulk aisles or mix and match a homemade batch. I like doing this though, because if I have too much of the dried fruits or nuts, I can just make granola or use it for a weeknight savory ethnic dish! Win-win! Today’s recipe is easy, vegan, and totally sweet tooth satisfying! This also makes a great gift or party favor. I use the Enjoy Life brand chocolate chips to keep it dairy free—they taste amazing! And you can easily make this nut-free by leaving the almonds out. I encourage you to get creative, visit the bulk aisle at your local grocer, and see what kind of mix you can come up with! Be sure to tag us on Instagram and/or Facebook with @Bluebirdandblackberries for either site. Now go, be a chocolatier! Maybe even put the movie Chocolaté on in the background. Prepare a rimmed cookie sheet with parchment paper or silicone mat, then set aside (I used a quarter sheet, but a larger one is okay too). 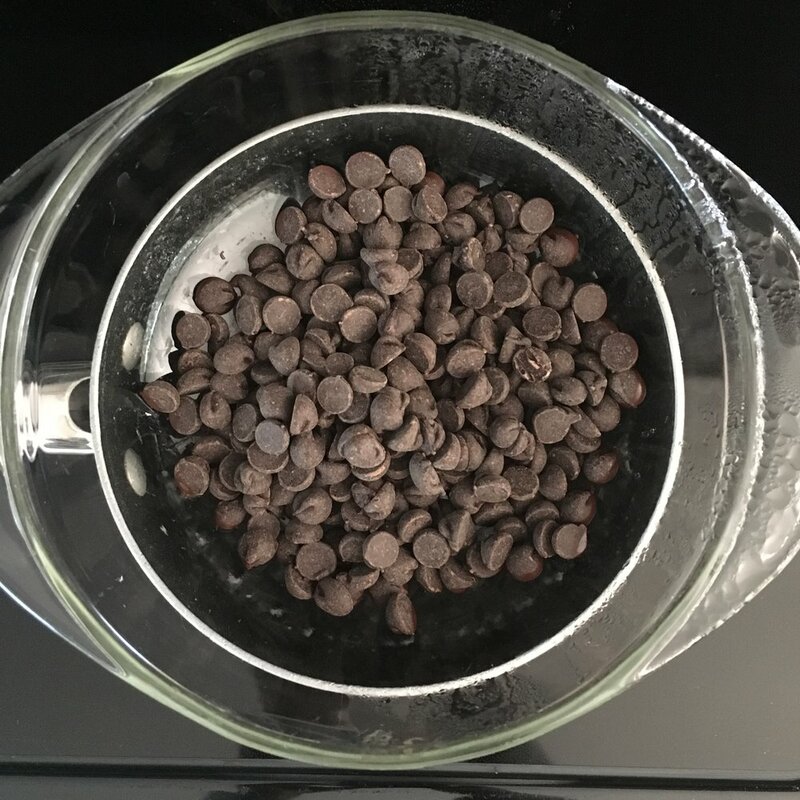 In a double boiler, melt the chocolate chips over medium-low heat, stirring occasionally with a spatula—about 5 minutes. While the chocolate melts, prepare the pretzels and almonds if you are chopping or breaking them into pieces. 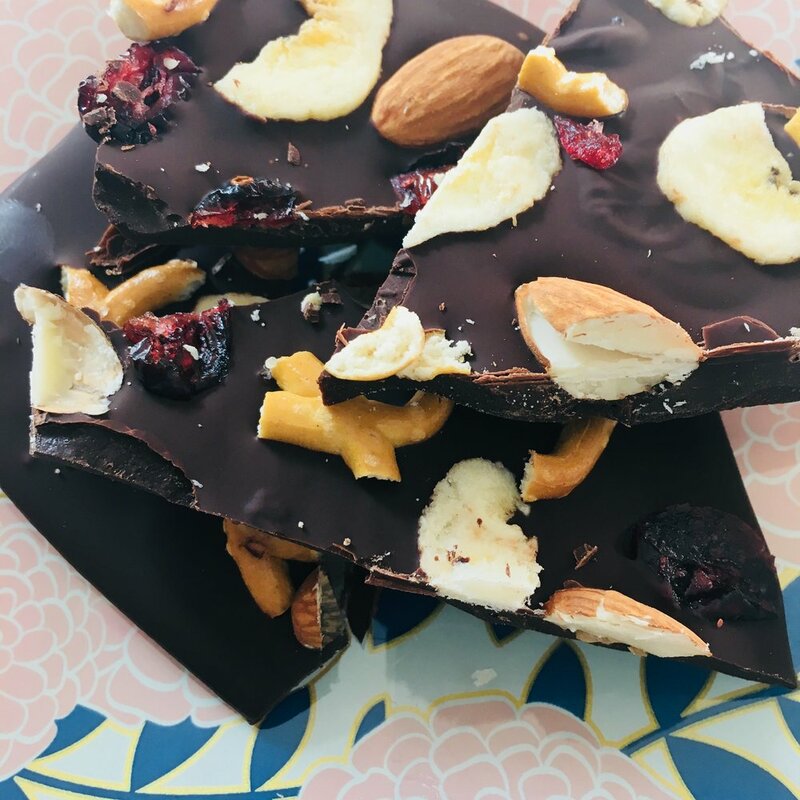 Once the chocolate is melted, spread it out onto the parchment or mat with a rubber spatula; once spread, my chocolate was about ¼-inch thick. Sprinkle or place your remaining ingredients over the chocolate and then place the pan into the freezer until the ingredients have hardened completely—10 to 15 minutes. Remove the pan from the freezer and break the chocolate mixture up into large pieces with your hands; you can also place the chocolate on a cutting board and chop it with a knife (the latter means your body heat won’t melt and smudge the chocolate). Now enjoy—and share if you’re feeling generous! This recipe can be made very allergy friendly. Leave out nuts, use gluten-free pretzels, and/or stick to dairy-free ingredients. If no allergy to seeds, sunflower seeds make a great nut substitute!